You can edit your documents offline with Google Docs. Google Docs, along with its companion apps Google Sheets (spreadsheets) and Google Slides (presentations), allows you to not just access files stored on your Google Drive account for viewing, sharing or printing, but also edit existing word processing documents and even create them from scratch. It even boasts built-in collaboration, allowing you to work on a document at the same time as a friend or colleague, and works with Microsoft Word files as well as its own proprietary formats. There are some limitations – you can edit and format the text for example, but you can’t do anything about any existing images, whether that’s resizing, cropping or even replacing them. 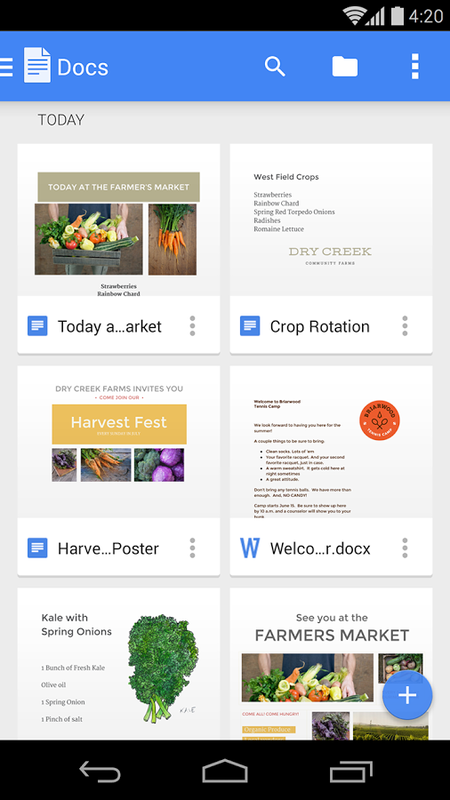 Google Docs is an intriguing prospect, and currently the simplest way to edit or create Google Drive-hosted text documents on your mobile. The inability to manage images is a minor irritant, but for making text edits or bashing out documents on the go, it's a good choice - particularly as it's free. What's new in version 1.2019.06204? Despite the editing limitations, Google Docs is a decent standalone tool for editing your Google Drive documents on the go - support for Word is welcome as is the ability to edit offline.